Navigational system with digital compass. Extra large dot-matrix screen available in 3 display modes. PDIS (Profile Dependent Intermediate Stops) optimizes your dive in complete security. Galileo's memory chip can hold over 100 hours of dive profile data and 100 bitmap images as a wreck map the diver can use to orient himself. An exclusive UWATEC achievement: the option to update Galileo's firmware through the infrared interface. You can download upgrade packages over the Internet to get new features and new languages. 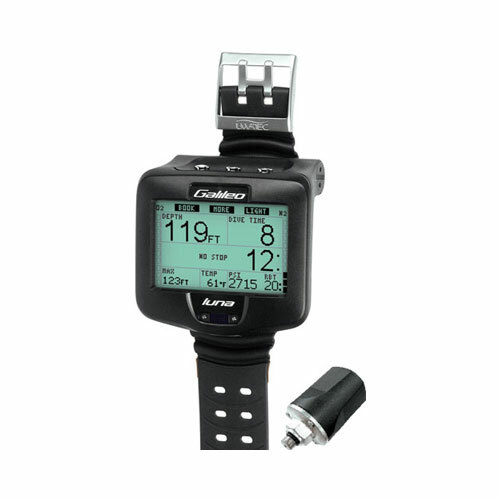 Predictive Multi-Gas upgrade: Purchasing this PMG feature at a later time, or whenever you need it, allows LUNA to use up to 3 Nitrox mixes (21-100% O2) during the dive, calculating the ascent schedule for all possible combinations of the programmed mixes. The outcome of the different decompression calculations can be shown on the screen in a dedicated deco summary screen. Heart Rate Monitor upgrade: Galileo's heart rate monitor, jointly developed with Polar (world leader in the field of heart rate monitors), not only measures and records the heartbeat during the dive but allows the dive computer to factor the intensity of the exercise into the decompression calculation, as it is reported by the diver's physiology. The HRM is also ideal for Apnea divers, measuring heart rate and sounding an alarm if the heart rate drops below the set level.